Our spring mayflies have finally started showing themselves on the Bitterroot. 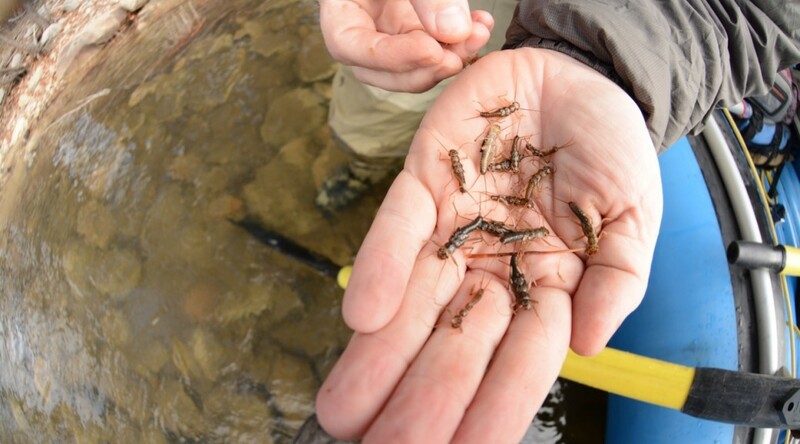 After almost a month of focusing on the Skwala stonefly, the March Browns are coming on with a vengeance on certain days and sections of the river. These bugs can be picky to their preferred weather, leaning towards humid broken skied days. 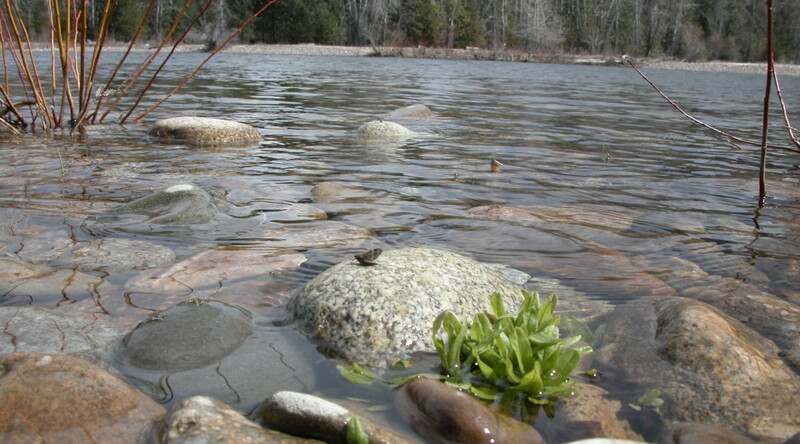 Unlike Baetis which thrive with torturous weather, March Browns like a little sunshine mixed with some clouds; too much rain will cancel the deal as it did on our Friday float trip. Fortunately, we took advantage of the hatch all day Thursday, and then Friday from its inception at around two o’clock, and saw epic fishing until a heavy cold rainstorm wiped the bugs out around 3:30. While waiting for the mayflies, we fished Skwala patterns to likely holds and found many good fish looking for our bugs. As I glanced towards a likely chop seam, I saw multiple good trout fully expose their red banded sides as they rose steadily, indicating they were onto a mayfly hatch. Right away we dumped the Skwala, tipped down to 4X, and started throwing small brown quill patterns to this pod of at least a dozen fish. They ate them, well! So be on the lookout for mayflies for the rest of this month, usually starting around 2:00. No need to get on the river before noon, unless you like your bobbers and droppers…. no thanks. There are some situations where one could run a nymph through a run, but the patient fisherman will find enough action on top in the afternoon to put a smile on anyone’s face. 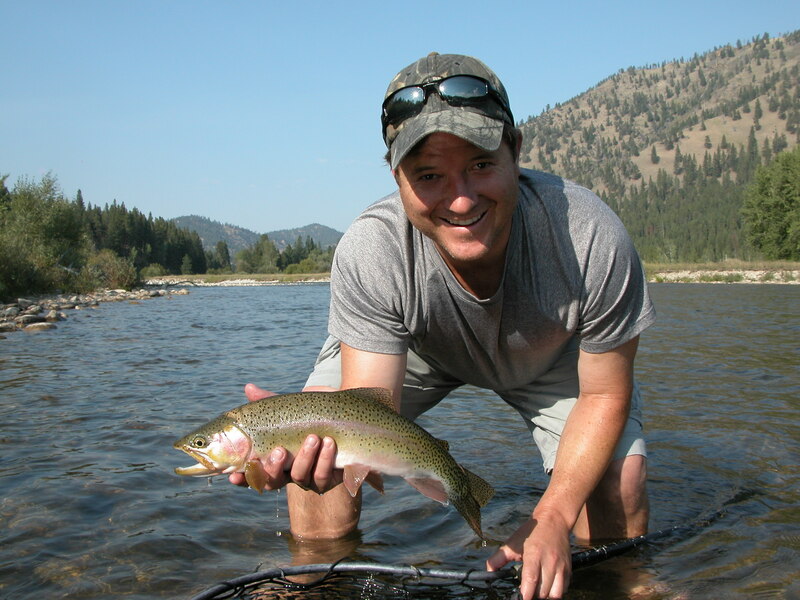 So take advantage of the dry fly while you still can, before runoff restarts the clock on our way to summer. It’s turning into another fine Skwala season here on the Bitterroot with tons of nymphs ready to hatch and good fish already looking up for a bug. Our weather took a turn for the better, shooting up to seventy degrees a couple times and really bringing out the solar energy needed to get the bugs hatching. Skwalas are looking for 46 degree water temps before they pop, so we’ve seen the bugs waiting until well into midday to start emerging. With that in mind, fishing-wise, take your time out there and don’t get into a big hurry. There’s plenty of other boats and anglers out there enjoying the hatch, and when the fishing is good, everyone is catching, and when it’s off, it’s off. That’s how the Bitterroot works: when she’s ready this river will fish lights out, but not until the fish and the bugs are ready to play along. Nymphing rarely saves a tough day here, but patience and working good water will bring many fine fish to the net. So every day should have it’s better moments until the surge of runoff wipes the slate clean for the upcoming summer season. We have a cool front with moisture predicted for the coming week which may tone down the Skwalas a bit, but will certainly favor the much awaited March Brown. 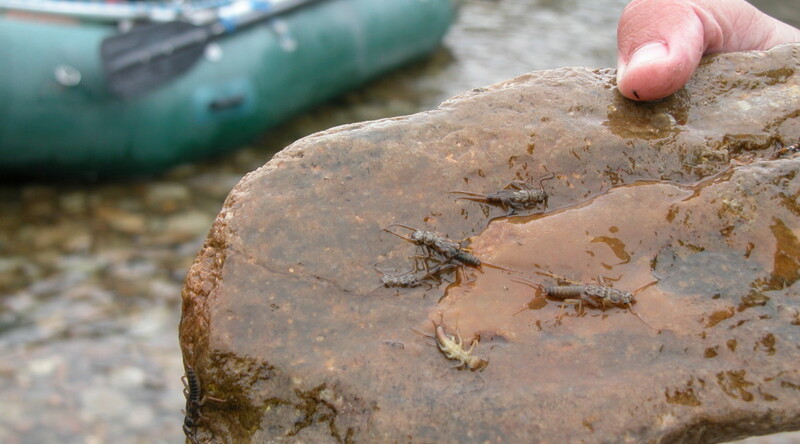 On our float yesterday, we had a massive emergence of these mayflies, making for the best fishing I’ve seen this early season. As we move on into April, the March Browns will hatch earlier and more consistent, right around 2:00, and in my opinion this is the hatch to fish. Skwalas get all the hype, but Bitterroot trout will pod up rising to mayflies, making for fabulous targets and fool hearty takes. So get on the horn and get in touch with us for some early season action. We still have a few weeks of pre-runoff fishing, which is truly some of the best of the season, and our rates are discounted to $350 per guide boat. 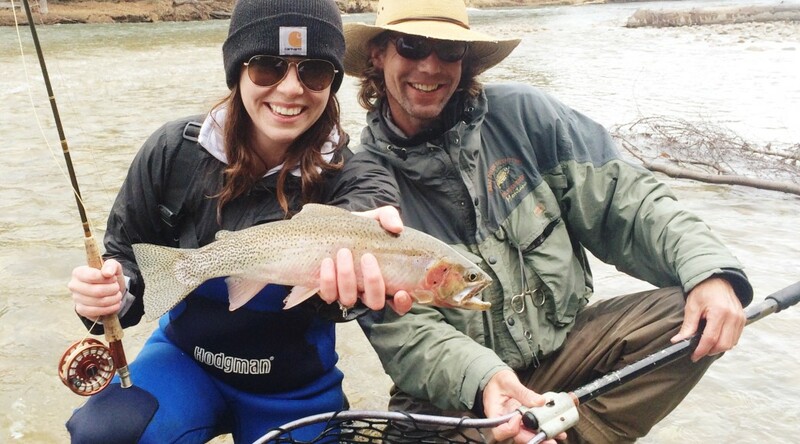 Bring a rainjacket for those spring squalls, and get ready to throw dry flies from the put in to the takeout. A quick afternoon float on a rising river was all we had going for us. New friends, Ryan and Heather, and a chance to see some new water together; at least new as of today with the rising tide of warm weather hitting the valley. 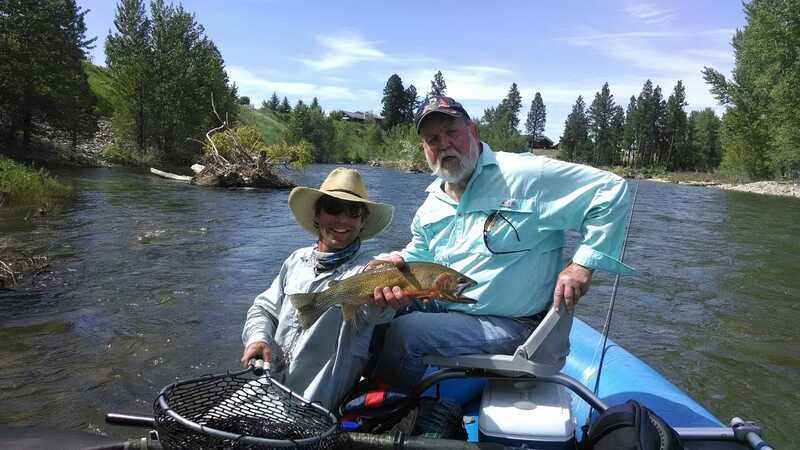 The first days of spring cometh, easy fishing on those once a week perfect days may be over, at least until the temps cool off and shrink up the melting snowpack. Every ‘good’ day brings a rise in the water levels which cool things off and bring on the sediment, making that sure thing a big question mark at the boat ramp. So fishing is up and down, good and bad, is what I’m getting at. That perfect day may actually be pretty tough because the river bumped and made all those perfect holding runs way too fast, or those soft banks turbulent and boiley. Our day was damn near a skunk, due to the previously mentioned issues, until things settled down enough late in the day to start producing some action. Savor those dry fly takes folks!, sometimes we may hold out for hours waiting and hoping, and all the while learning and enjoying the river on it’s rise to runoff, happy to be out once again chasing wild trout on the fly. I figured we’re still early, and we are, but a mid morning phone call today sure led to some fine dry fly fishing on the home river. Skwala: The Bitterroot’s Big Deal. Which they really are, even if it brings a bit of pressure to our sleepy little river; get out there and throw a line and put your smile on. The rest of the state is still dealing with winter, at least its departure, while the Bitterroot Valley is gorgeous and temperate as ever: snowcapped peaks protecting a low altitude, Pacific sided drainage. So we slid the boat in around the crack of noon, or even one o’clock, to see if we could find a few fish looking up. Sure enough, our second run drew a fine rainbow to the dry, then the next, and the next, and then they were sipping mayflies…. Pretty damn impressive to say the least. The true Bitterroot Skwala hatch is still weeks away in my opinion, but the fish certainly know what’s coming. I witnessed Baetis mayflies and midges today, but no mature adult Skwala moving about. So watch your weather for those good warm days in the near future, there should be some fine fishing to be had out there. The weekend is looking beautiful, so I’d bet there will be plenty of other folks out there chasing the hatch. My advice: take it easy, put in good ‘ol Bitterroot fashion around noonish, and fish the nice likely runs with medium speed and a wee bit of chop. 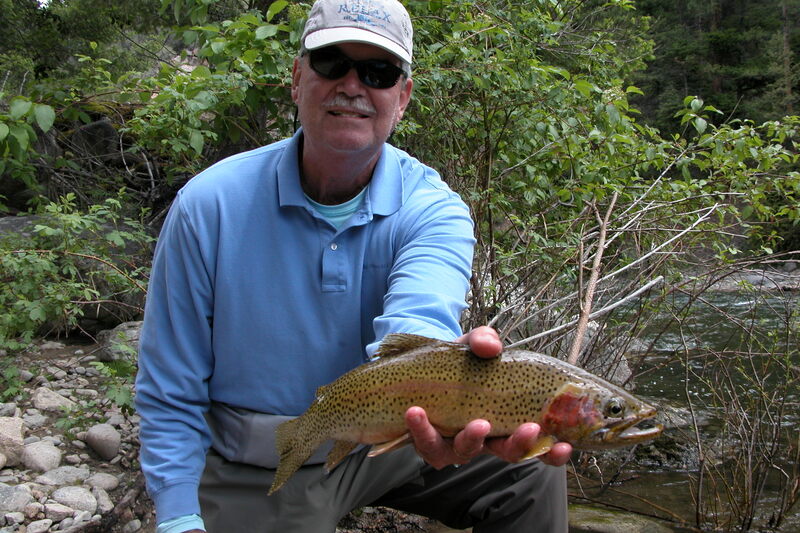 Look for your best fishing from two to four, and savor throwing a dry fly once again! It’s been a great fishing season with everyone who came to experience this slice of Western Montana with Bitterroot River Guides. Starting back in March chasing the Skwala hatch, to sniping big bows and browns on the Fall Baetis on the Missouri, starting anytime now, we’ve enjoyed the many friends and faces throwing a line from our rafts. We hope to see you all again out there on the river, whether it is in a monsoon on the Big Hole in May, or on one of those perfect July bluebirds on the Bitterroot. Enjoy the photos and see you next year. Just as September is rolling around and the fishing should really start picking up for Fall, a crew of great friends of mine from the flatlands of Kansas showed up here in the Bitterroot for a three day adventure. With five fishermen in the group and three guides, we set out to give it our best on the main stem of the river for the first two days, then one final shot at the West Fork the last day. Fishing was tough on the main Bitterroot with high daytime temperatures and bright sun; great for a vacation, but weather like this takes a toll on the bite. As evening approached, fish began actively rising, saving the day for us guides and giving us some targets to throw at as the day turned to dusk. Pulling out at Otto’s Cabin where our group is staying right on the river, we anchor up for the night and leave the boats for an early start there in the morning. For all of you looking for a perfectly situated, peaceful, and simple getaway look no farther than this little gem resting on the banks of the Bitterroot river. Our final day of fish camp led us up the West Fork of the Bitterroot, looking for big cutthroats in the cold canyon waters coming off the mountain peaks. This time of year water levels are down to a trickle, but there was still plenty to get the boats through and plenty of fish for our anglers. Between stripped buggers and well fished grasshoppers, everybody found big trout to take the fly, making for the best fishing we saw over the three day span. The West Fork can be like that, especially after a couple days of plugging away at the main stem and getting little returns. Bring your A game and this river will reward you mucho. Thanks to the Kansas boys for a great time with old pals on a Montana trout stream. The summer is in mid swing and our rivers are holding out big time this year for us. Still way up above historical average on water flows, the Bitterroot continues to fish excellent even with our high temps during the midday times. Recently, I fished with a good friend for a three day adventure, chasing fish up and down the Bitterroot system. From the West Fork up high to downstream right around Hamilton, we found lots of great fishing with dries, and really any other method of fly fishing for that matter. Get that bug on the right drift and keep it there, they’ll find it. For our last outing, we invited the boys to tag along and get their first taste of Montana fly fishing with Dad. Great fishing, a major log jam portage, lunch on a sand bar, and a rendevous with the girls later in the day added up to a superb adventure on the river. Thanks to the Jacobs family for another year of fishing and family in the Bitterroot Valley. See you next year.